The Enhanced Interior Gateway Routing Protocol can be configured using either the classic mode or the named mode. The classic mode is the old way of configuring EIGRP. In classic mode, EIGRP configurations are scattered across the router mode and the interface mode. The named mode is the new way of configuring EIGRP; this mode allows EIGRP configurations to be entered in a hierarchical manner under the router mode. Each named mode configuration can have multiple address families and autonomous system number combinations. In the named mode, you can have similar configurations across IPv4 and IPv6. Although Named EIGRP is configured differently from traditional EIGRP, the configurations are compatible, meaning that an EIGRP-speaking router configured with the traditional approach can form a neighborship with an EIGRP-speaking router configured with the Named approach. Address-Family: to configure networks, EIGRP neighbor, EIGRP Router-id, metric etc. Address-Family-Interface: to configure all the interface specific commands that were previously configured on an actual interface (logical or physical) and moves them into the EIGRP configuration. For instance EIGRP authentication, split-horizon, summary-address configuration etc. Address-Family-Topology: to provide several options which operates on EIGRP topology table. For instance redistribution, distance, offset list, variance etc. To better understand how named EIGRP works suppose that you want convert this classic eigrp configuration to the named eigrp configuration. 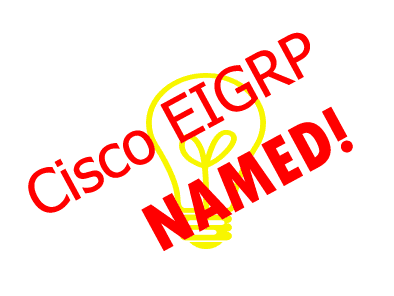 Remember: Even though Named EIGRP is configured differently than traditional EIGRP, the show commands remain the same. Note: From IOS 15.4(2)T or IOS XE 3.11S, Cisco has introduced the “eigrp upgrade-cli” command. This feature permits to upgrade EIGRP “classic mode” configurations to named mode without causing network flaps or requiring EIGRP process restart. After conversion, the show running-config command will show only named mode configurations; you will not see any old classic mode configurations. The Enhanced Interior Gateway Routing Protocol can be configured using either the classic mode or the named mode. The classic mode is the old way of configuring EIGRP. In classic mode, EIGRP configurations are scattered across the router mode and the interface mode. The named mode is the new way of configuring EIGRP.